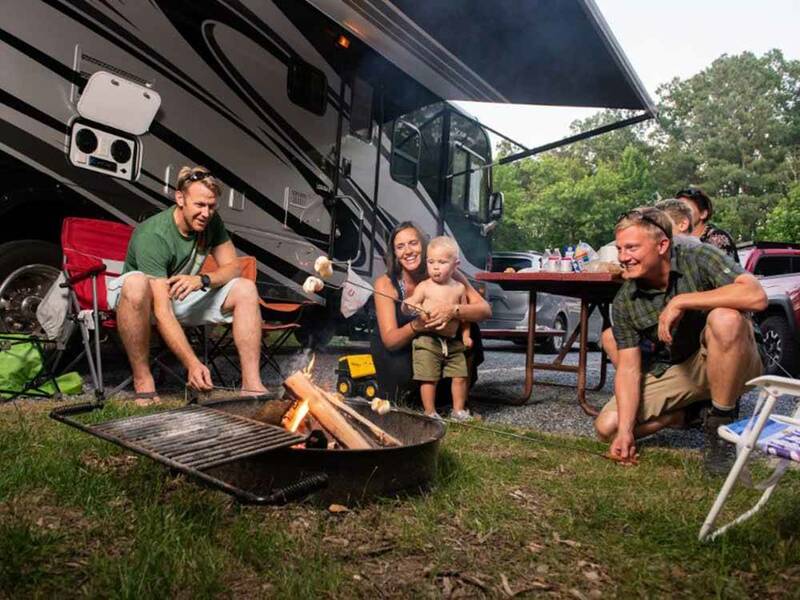 As the closest RV park and campground to Washington, D.C., Cherry Hill Park is the perfect place to stay while camping and exploring our nation's capital. Come visit and have a Monumental Experience! Cabins have air conditioning and heat, cable TV, WiFi, a picnic table, a BBQ grill and an outside deck. Four cabins are pet friendly (extra fees apply). They also have handicap style cabins. Two cabins will sleep up to 12. The yurt is air conditioned. What a wonderful site. So many things to offer, you never have to leave. But if you do they offer a city bus stop right on site to the metro. Which we took right into DC. The staff is super friendly, HUGE laundry room. Very clean and well appointed. Big machines you could even wash a comforter or standard size. Park itself is very pretty and a joy to walk around. Club house and eating area stayed open very late. Even had a hot tub! Traveling full-time in a 38-foot coach we stayed 23-nights in a site for big rigs (site # 506). Pd $69 night. The good….if you desire to stay close to DC this would be an excellent choice. This is a very well-kept and quiet park with great amenities. There's a cafe on site plus they offer a travel/trip adviser. Take advantage of this as their expertise will help make your excursions into DC much easier. There's even a bus stop at the front of the park. If you have a dog there's ample area to walk your pet plus a fenced dog park. This park has decent wifi and our AT&T phones worked great here. Our satellite did receive reception, however most of the sites have way to many trees to receive satellite reception. This is not a dusty park so the dust on your coach will be minimal compared to many other parks. Big coaches need a gravel pad, so we give this RV Park a 5-star rating for the thick gravel pad. Each site had room at the side of the coach for sitting and relaxing while BBQ'ing. The bad...if your site is next to the freeway you may hear some traffic noise and in the wintertime the noise is a little more noticeable due to the lack of tree leaves blocking the sound. This is a great place to stay and we highly recommend it! We're really glad to hear we were able to provide everything you needed for a pleasant stay in your rig! Thanks very much for staying with us, and we hope we'll see you again next time you're in the area. This is the perfect place to stay when visiting Washington DC. It is a well kept, full service RV Park. There is a restaurant, pool, water play area, mini golf, 2 dog runs, play ground, laundry and multiple bath houses. The staff are very knowledgeable about visiting DC and can book various tours and activities, for you. We did no use those services as they also provide thorough information on visiting DC using public transit. The public bus stops right in the campground. Will definitely stay here whenever we are in the vicinity of DC. We stayed form July 27 - July 30, 2018. This is one of the very best RV parks that we have stayed. The location of the park and the ease of getting to the Washington, DC area is a big plus. The facility and the staff are first rate. The RV lots are excellent. Even though they gravel our leveling system did not sink. These sites are dressed after every departure. We had our 5 year old granddaughter with us and she had so much fun that she wanted to stay longer. 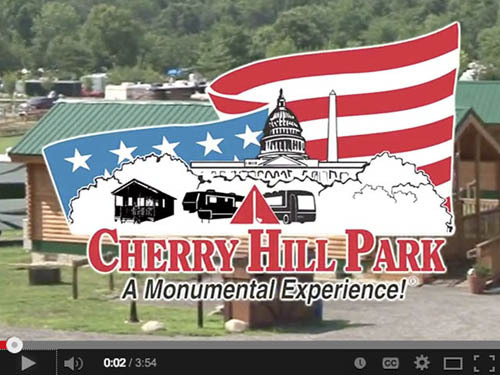 I recommend Cherry Hill to anyone traveling to the DC area. Thanks very much for visiting us! We put a lot of time into making sure our gravel pads are densely packed, and we're really happy to hear it paid off. Happy trails, and we hope we'll see you again next time you're camping in the area! This was a FANTASTIC place. I’m not sure where to begin..... i wish we had had more time to stay there and take advantage of everything. The spots were spacious & level & easy to access. The campground was well managed & secure. They worked hard to help with your travel plans to see the sites in Washington. Their on site store was a super help. We will go back! As an avid traveler, we decided to stay at Cherry Hills Park for the March to Our Lives Rally. This is a large park with a family friendly atmosphere. Lots of activities for the kids in your family to do. The Bath Houses are well appointed, numerous and kept very clean. The internet is the best I have seen in any park I have ever visited and they don't throttle you down if you want to stream your favorite shows from your laptop. They have an extended cable service which gives more than the standard fare from most parks so your down time is enjoyable and "homey". Several community buildings with things to do keep you busy with an on-site cafe if you want a quick, good meal without the fuss. The best part is, if you want to go into DC to sight see, you have great options. You can drive 15 minutes to the Metro, or catch a frequent bus right near the front that will take you there. I highly recommend this park if you are ever wanting to take advantage of Our Beautiful Nation's Capital. We're so glad to hear you enjoyed your time with us! Thanks for staying with us, and happy trails! This is a very well maintained park with plenty of facilities for all ages. We stayed here to visit the Smithsonian and it was very convenient with a Metro bus stop at the camp that took you to the train station. From there you could go anywhere in Washington. The park sells metro passes and you can go back and forth for just a very few dollars, so easy. The only downside to the park is the noise from I-95. We love the Smithsonians, too! Thanks for staying with us and we hope to see you again some time down the road. Beautiful campground, spotless facilities, friendly staff. We’re already planning another stay in the Spring. Great park. Very helpful with sightseeing information Highly recommend. Stayed 8 days and would return to this park again. One of the best RV parks I've ever stayed in. Nice park with level sites. The staff were very friendly and accommodating. We enjoyed our stay. Great facilities. Buss to metro station leaves every 30 minutes and makes it handy to visit DC which is why we went there. We liked it so much we extended our stay. This place was very clean and well maintained. The staff was friendly and let us check in at 6am after a night of driving. The biggest issue is the noise from I-95 as some other reviewers have noted. I am a transient - on my way home after being on the road for a while, but if I come in our Marathom Coach to visit Washington DC I would stay here again. One of the top parks that we have stayed at. Closest to Washington DC. Clean, well maintained, plenty of bath houses and clean too, great customer service. They also provide people that are very knowledgeable about D.C. , providing tour information and selling tour tickets, and metro tickets. Tour buses pick you up at the campground, city buses pick you up and drop you at light rail stations. Made it all very efficient and effortless. Black top roads, gravel pads, but the best gravel pads I have been on, not dusty and the rocks are just large enough not to be carried into the RV. Easy connections for electric, cable and water (good quality water). Yes it is a little more than most, but look at where it is and what they provide. GREAT RV park. Everything you could possibly need to visit Washington DC is right here. They were so helpful teaching us to ride the Metro that we were experts after the first trip. The store is great, the WiFi is great, cable is great and there are 2 fenced dog parks which we loved. The only drawback is the close proximity to the highway, but you can't have everything! Definitely recommended!! Thanks very much for leaving us your feedback! We're glad you and the dogs enjoyed your stay. Happy trails! Sure, it’s pricey but I’ve paid only $10 less per night for campgrounds that aren’t half as nice as this one. This park has a great location, terrific facilities and excellent service. They know that many of the people coming here want to visit Washington, D.C., so they provide extensive support for your sightseeing experience. I can’t find anything to fault. The bathrooms are sparklingly clean, the free WiFi worked consistently and the hookups are in great shape, including a cable connection. The driveways are asphalt in good condition and the site pads are gravel. We paid $61.20 per night with a Good Sam discount for a back in site with 50 amp electric service. We're very happy to hear that you enjoyed your stay! Thanks for the review, and we'd love to see you again next time you're in our neck of the woods. Excellent campground. Great location for the subway into DC and a supermarket just down the street. Great sites with easy access and very good bathrooms. We would stay again, value for money. 5 stars all the way. Some locations not good for big rigs like ours. Very hard to get into with 5th wheels & their trucks out on the road in the way, had to have several moved & we had to also move our for others car. Not enough rm to park a small car. Day gate guard rude & not helpful. Wifi weak, kept getting knocked off. And very expensive for 2 adults not using the facilities. My wife and I came through DC to see an Orioles game and a Nationals game 2 days later. We also got to visit DC. The staff was very nice and courteous. The grounds and park are outstanding and beautiful. It was easy access to the interstate to drive 30 minutes to Baltimore for the game. Then we took the bus, which stops in the park, to the Metro to get to DC. We have already decided that when we come back to DC, we will definitely be staying here. This is a park that is good for all ages. The grounds themselves are beautiful and well maintained. Restrooms are clean and the laundry room is huge. The staff is friendly and helpful. There is easy access to the metro and the highways. A nice local shopping center is just down the road. While the price might seem high you have to consider that you get a lot of bang for your buck and this is the D.C. area so the cost is actually reasonable. Great WIFI! Can't believe this park exists so close to DC. Very friendly staff, easy check-in process, great on-site restaurant, Metro bus stop in the park, nice pools, mini golf (proceeds donated to charity), and a nice workout facility. Resources for RV repairs and detailing available. Management has orientation sessions on DC attractions and sites. Metro ran right on schedule. The campground has a program where unused balances on Metro cards can be donated to a homeless veterans group. Rates are a little pricey but worth it. Did I mention great WIFI? Would absolutely stay here again! Truly impressed as soon as you pull into campground. Very easy check-in with the staff being extremely friendly. It was very nice having the roadway gated to keep unauthorized people from entering. The layout of the campground was impressive with all facilities centrally located. The sites were a little close but manageable. Great family park and activities for all ages. Extremely easy access to the Metro Rail System into Washington DC. Most impressed with the restroom facilities. EXTREMELY clean and I mean clean. Store was well stocked. Campground was very clean with no garbage laying around. I always say you get what you pay for and it showed here. I will never stay in another hotel in DC as long as this place is available. We will return. I would like to thank the staff for their hard work in maintaining this facility. There was some confusion at check in but the manager quickly resolved the problem. This was our fourth trip to the DC area and our fourth return to Cherry Hill. The staff and amenities are first rate. They are always improving the campground. Each year we see improvements. We plan on returning to Cherry Hill whenever we are in the DC area. The Campground worked hard to attain their Good Sam Rating, the results stand for themselves. Good Sam Members can be assured their stay at Cherry Hill will be one of the best memories they take away from DC. We have a ball each time we stay , you will too. This is a 5 star park any way you look at it! If we needed it, they provided it, including a bus stop on premises, orientation and transportation for tours of DC, a resturante onsite, RV wash, dog walker, gravel sites with grassy areas, no wet feet even in the rain! We had to leave early and they refunded the day we did not use with a smile. Good store onsite as well. Probably the best park we have stayed in. You definitely get what you pay for with this RV Park. Don't let the daily rental rate keep you from staying here! What you save in fuel,parking and headaches by not having to drive into DC more than makes up the difference compared to less expensive parks. We took public transportation from the park 6 of the 9 days we were there. The park is convenient enough to take day trips to Gettysburg, Harper's Ferry, Baltimore, etc. in your own vehicle as well. The on sight convenience store was well stocked and we found that the prices we comparable to the grocery store a mile down the road. The staff was very helpful and friendly. The food at the café was delicious, also comparably priced to the other local cafes. It was actually better than some of the places we ate downtown. Don't miss the orientation meeting on your arrival date. You'll be traveling on the metro like a pro and eating with the locals. My daughter and I stayed here in September in order to visit the Washington DC museums and archives. This park allowed us easy access to public transportation which included close proximity to the Metro and shuttle bus services from within the park. The staff was extremely helpful in getting us to use all available amenities. And the park is super clean and the sites were large and well appointed. I will go back and also I recommend it to anyone who wants to visit this area.. Truly the best campground to tour DC from. Bus to Metro pulls into park and bus stop is in the park by the front office. Bus takes you to the Metro Station; Subway takes you anywhere you want to go in DC. Trying to do DC other ways have failed for us, however this worked very well to get back and forth to DC. Clean well maintained park. The only reason we didn't give it all 5-stars is that it was too big for our liking. But everything else was great. As far as I know it is the only RV park with an on-site Metro bus stop so you don't have to drive into DC. That alone makes it worth staying in. Excellent place for visit to DC. They supply everything you need to make your trip memorable, from tour information to the transportation to get you where you want to go. Highly recommended! Employees all friendly and helpful. Sites are tiny roads are tight and they seem to forget that rv's are taller than their golf carts. Impossible to get to a site without hitting branches. Road noise is loud and goes on all night. Way overpriced for what you get. Thanks very much for leaving us your feedback, as it helps us to find the areas where we need improvement and better meet the needs of our guests. We're sorry to hear that there were issues with noise and that you found our park hard to navigate. Over the several past seasons, we have been working on expanding the size of many of our sites, so that even big rigs can fit comfortably and reduce any obstacles for incoming guests. Should you decide to visit us again, I hope you'll find your experience more pleasant. Thanks again for sharing your experience with us and for choosing to stay with us for your vacation.